Does Tap Water Have More Minerals Than Filtered Water? Competing claims may have you wondering, "What are the effects of carbonated water on the body?" Carbonated water contains dissolved CO2 gas. Carbonation can occur naturally in spring water that picks up carbon dioxide stored in rocks, or it can be forced in by the manufacturer. 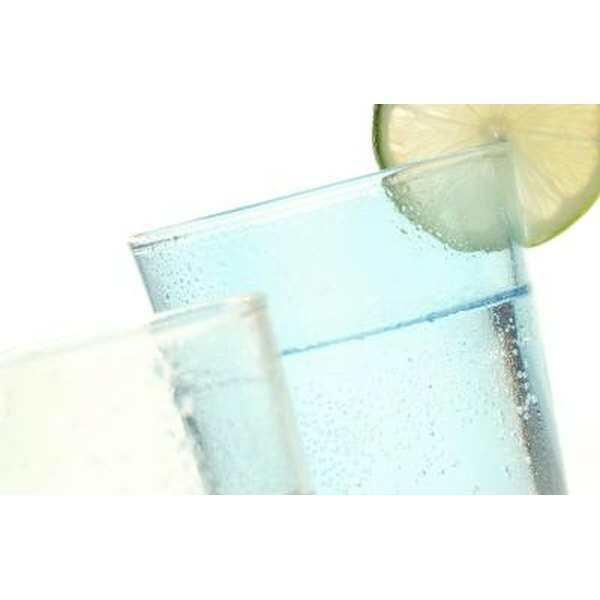 Claims have been made that carbonated water erodes teeth and bones, leaches calcium and increases acidity in the stomach. These claims have not been borne out by experiment. In a healthy human, carbonation of water does not lead to ill health effects. Carbon dioxide (CO2) gas is expelled by the lungs, so some people expect that ingesting it is unhealthy. However, CO2 is absorbed very slowly through the gastrointestinal tract, at a much lower rate than it is produced in cells and expired out of the lungs. The gas expansion from release of dissolved CO2 in carbonation can lead to the distension of the stomach. Aside from the less serious case of triggering hiccups, irritable bowel syndrome (IBS) can also be aggravated. Furthermore, the stomach distension may reduce the effectiveness of stomach acid to digest food that requires sufficient acidity. Sufferers of IBS are advised to eliminate carbonated drinks from their diet (as well as many other items) to allow the GI lining to heal. CO2 reacts with water to become carbonic acid (H2CO3). Some have argued that this excess acid in carbonation is dangerous. The stomach, however, is much more acidic (pH~1-2), and overwhelms the acidity of any carbonated drinks. To be concerned about ingesting acids that would make the stomach too acidic is misguided. It is a common misconception that digestive problems originate from too much acid in the stomach. Actually, antacids are oftentimes the opposite of what is healthy, since inadequate acidity can lead to insufficient digestion, which in turn leads to increased activity of intestinal bacteria, which causes increased bloating and reduced nutrient absorption. Furthermore testament to the safety of carbonic acid in the body is that it exists in the blood as a natural step toward the expiration of CO2. The blood level of carbonic acid (of metabolic origin, not ingested) is tightly regulated by the body. Therefore, the introduction of carbonic acid by ingesting carbonated water is not likely to cause harm to the blood system. It has been claimed that acidic ingestion from carbonated water can lead to leaching of calcium from other parts of the body. This would be of concern because bones are made of calcium. Calcium deficiency leads to osteoporosis. This claim has not been upheld in studies--not even when the stronger acids in soda have been tested in addition to carbonic acid. A study at Creighton University found no significant link between carbonated drinks and urinary excretion of calcium, a useful indicator of calcium depletion. Another study followed women in Spain during two months of drinking carbonated water; their bones were found to be normal at the end of the study. Is the carbonic acid of carbonated water harmful before reaching the stomach? Below a pH of 5.2, the enamel of teeth is dissolved. Therefore, there is a mechanism by which carbonated water can have an unhealthy effect -- theoretically. CO2 absorbed into the world's oceans (effectively a carbonation process) may be far more harmful than drinking carbonated water. It has been estimated that half of the anthropogenic CO2 produced between 1850 and 1994 from fossil fuels and cement production has been dissolved into the oceans, increasing their acidity with the carbonic acid that the CO2 produced. The resulting carbonic acid dissociates, adding a hydrogen ion to the seawater, which can then leach carbonate ions (CO3(2-)) out of seawater before shellfish can use it to build their shells. What Are the Health Effects of Drinking Too Much Soda Pop?